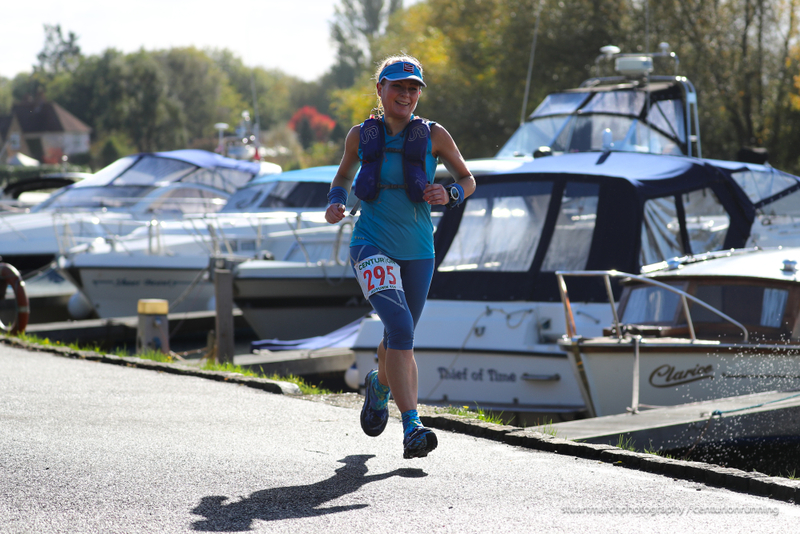 The 2018 Autumn 100 was our final 100 miler of the season and our seventh edition of the event. This was the second year in succession that we had a named storm come through over race weekend, something which turned it into somewhat a race of two halves. 235 runners gathered in Goring and set off north on the Thames Path at 1000 Saturday morning. Amongst them, 39 Grand Slam hopefuls looking to complete their fourth and final 100 of the 2018 season. It was no surprise to see two runners go off of the front together. 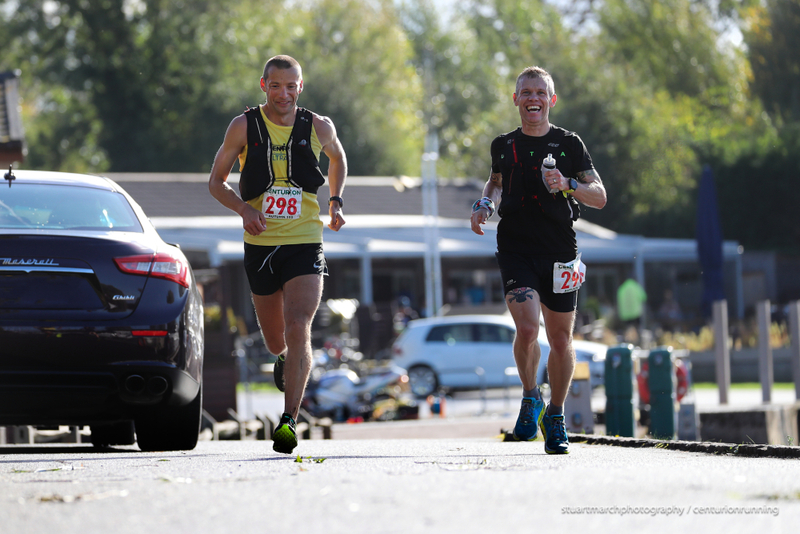 Craig Holgate and James Stewart are both members of the GB 24 hour team and looked comfortable out to Little Wittenham and the first turnaround point at 12 miles in 1:29. But it was not to be for either of them this weekend. Craig came in with some lingering plantar fasciitis and was struggling right from the gun, he quickly decided he would only see out the first leg. James twisted his ankle just a few minutes into the race and although he led deep into leg two, he was forced to withdraw before making the half way mark. Incredibly bad luck for him. Russell Arnold had shadowed James Stewart for much of the first third of the race and once James withdrew he was left leading, coming into Goring mile 50 in 6:49. 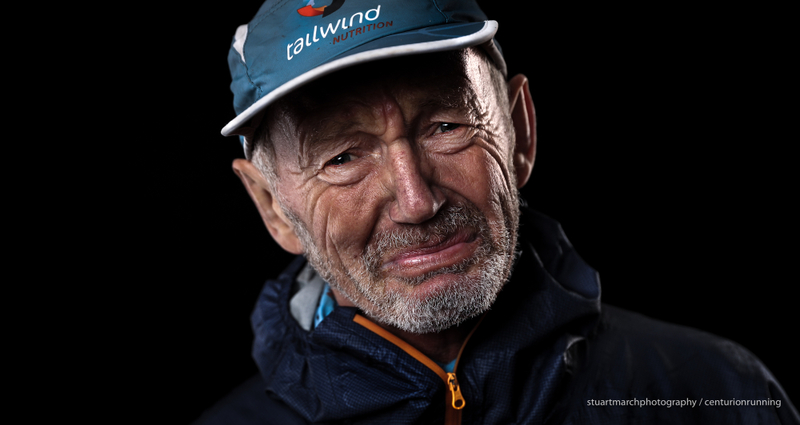 He led James Williams, fresh off of his fourth place at the NDW100 by just 5 minutes at that stage and it looked like we were on for an exciting race. Things did not disappoint. 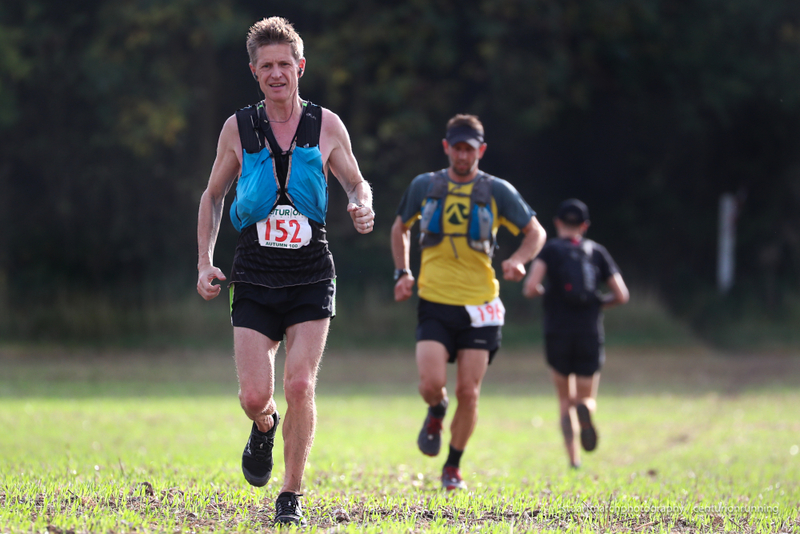 Russell stretched his lead out on leg three particularly outbound and returned to mile 75 with an 18 minute gap over James and a 29 minute lead over TP100 champion and Grand Slam leader, Peter Windross. The final leg was superb racing and it was exciting to see the runners push one another to their best days. 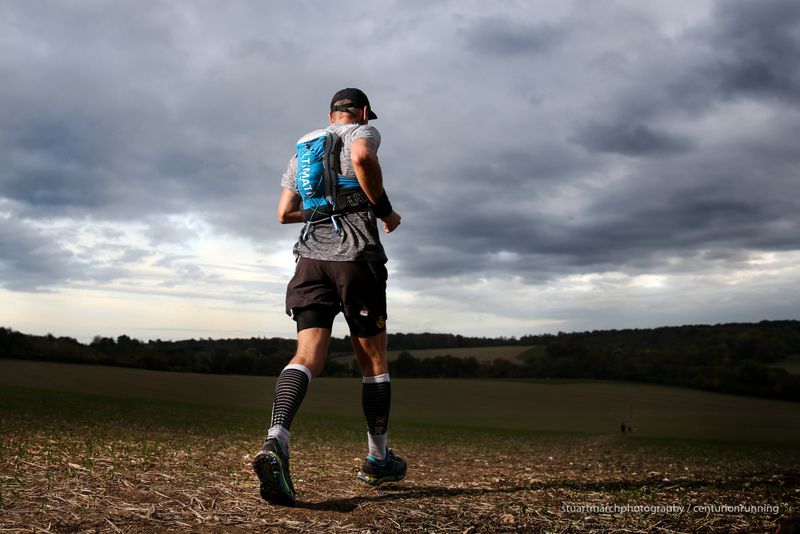 James began the charge from Whitchurch at Mile 79 where he trailed by 20 minutes, reaching the turnaround at Reading mile 87.5 just 8 minutes back, before overhauling Russell with four miles to go on and win in a time of 15:18. Russell came home a superb second in his first 100 in 15:29. Peter Windross picked up third in 15:35. In the womens race, there was a deep and experienced field of runners coming in, all of which had a good chance at success on the day. As in the mens race, the conditions and early pace took their toll and early front runners were forced out within the first half, before the eventual contenders were finally made clear. Mari Mauland previous winner at this race led off of leg one, a few minutes ahead of Laura Swanton with three podium finishes in the other three 100s to her name already this year. Unfortunately for Mari, her day ended shortly afterwards, which left Laura out in front on leg two. 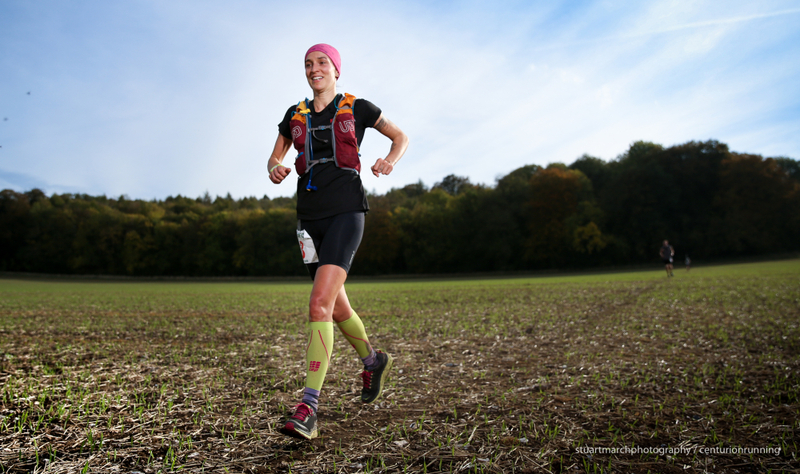 She came back to Goring and the 50 mile point in a time of 7:57 for a lead of 23 minutes over second placed Rachel Fawcett. Third at that stage was being held by the super experienced Annabelle Stearns in 8:22 just behind Rachel. Laura forged ahead, hoping for a dream finish to her Grand Slam and she stretched her lead to a seemingly unassailable 57 minutes coming in off of leg three to the 75 mile point. Rachel Fawcett still in second in 13:45. By this stage it was two of the international runners in the womens field who were showing their vast experience and moving up through the field. Sharon Law was 8th early on before moving into third by the end of Leg three in 13:51 just six minutes back of Rachel. Wendy Shaw hovering just off the podium places in 13:58 elapsed. Everything changed over the final leg apart from Laura's hold on the race. 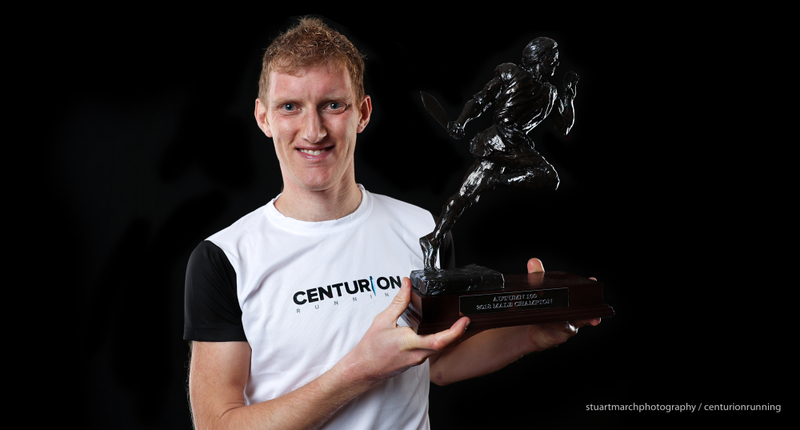 She ran home for her debut Centurion 100 mile win in 18:27 and took the Ladies Grand Slam title in the process. It was wonderful to see her end a consistent year in such great fashion. Sharon and Wendy both ran extremely well over the final leg to take home second and third respectively. 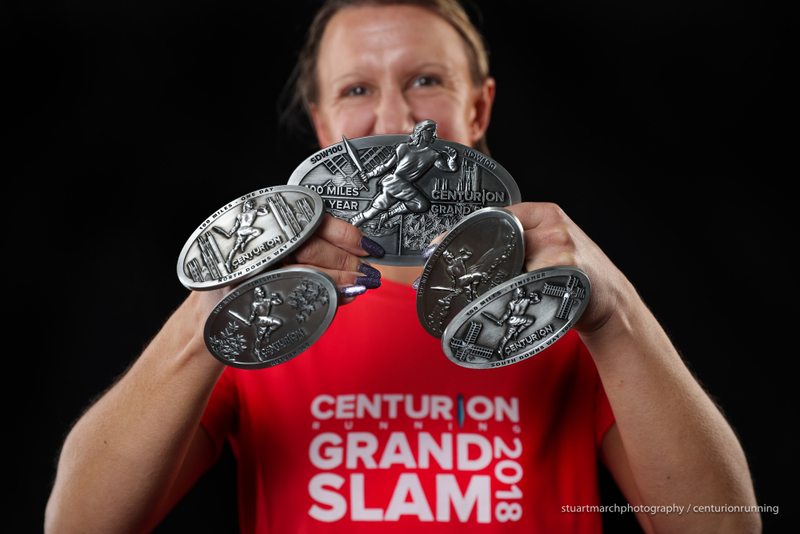 Rachel Fawcett missed out on the podium by just 2 minutes but took second place in the Grand Slam in the process, another fine end to the year. All in all we welcomed 168 runners over the line for a solid finish rate of 71%. 85 made it home under the 24 hour mark to earn their 100 mile - One Day Buckles. In the Grand Slam, Peter Windross with his third place saw out a year of tremendous consistency, shattering the existing Slam record by over an hour and 45 minutes to set a new mark of 66:57:48. Second went to Alex Whearity in 77:24 and third to Andrew Smith in 81:40. Laura Swanton won the womens in 77:57:46 over Rachel Fawcett in second in 85:30:39 and Maria Russell in third in 96:37:49. Ken Fancett continues to set record after record and completed his sixth Grand Slam on the day. A notable mention also for Dave Brock. Dave came in to the 50 mile mark in considerable pain in both his back and leg. He was able to rouse himself out of the door for Leg three with just 31 minutes to spare inside the cut off. He then pulled off the rarest of all feats, a negative split in a 100 mile event (noting that the second half of the A100 is a mile longer than the first also) to come home in 27:07. A truly remarkable achievement and an amazingly gutsy run to complete the slam. In the age group categories. Peter Windross took home first MV40 and Sharon Law FV40. Eduard Egelie in his sixth appearance at this race took MV50 and Michelle Payne the ladies V50 cat - also setting a new record of 23:39. MV60 went to Kenneth Fancett for the sixth time in six starts here, and Sandra Brown the FV60 for the second time in two starts. Both still hold the V60 category records. Sandra Brown also continued her progress towards the truly astonishing target of 200 x 100 mile life time finishes. Her finish here was a 196th successful 100 mile race completion. John Fanshawe won the MV70 category for the second time, and in completing the Grand Slam, becomes the first V70 to do so. The final Grand Slam table is now available here. We move on to our final event of the season on November 17th up at Wendover Woods which concludes an incredible 2018. A huge thanks as always to our sponsors but the biggest thanks of all to the 88 volunteers who enabled this race to pass off successfully and safely in very trying conditions.